Designed with the modern Muslim family in mind. 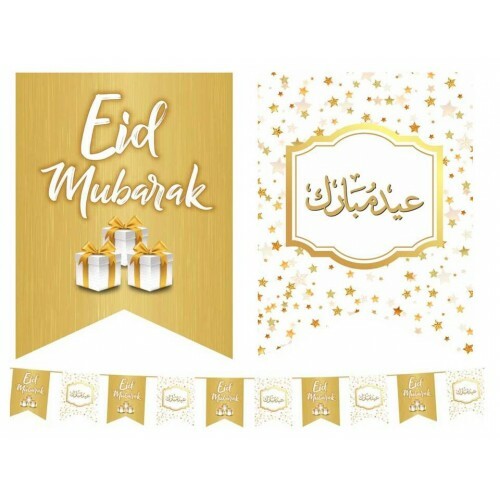 These stunning set of 10 White & Gold Eid Mubarak Flags grabs everyone's attention when they see them for the first time. Everyone say "Ooh I love the presents" and you will too. 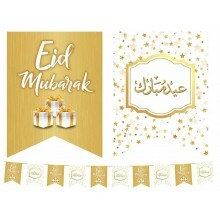 Matches perfectly with the White & Gold Eid Mubarak Double Banner and Gold Eid Mubarak Balloons. Stretches over 3 metres.Each flag is 22.cm high x 17cm wide.